Highly effective, highly concentrated, NTA-free detergent for removing stubborn oil contamination, animal and vegetable fat encrustations, aged wax and resin encrustations, protein, sugar fractions and charred residues. Ideal for use in power stations, industrial plants, forwarders, swimming pools, shower cubicles, factory rooms or construction vehicles and working equipment in the food industry. Ideal for surfaces such as tiles, plastics, lacquer and tarpaulins. Easy to dispose of. 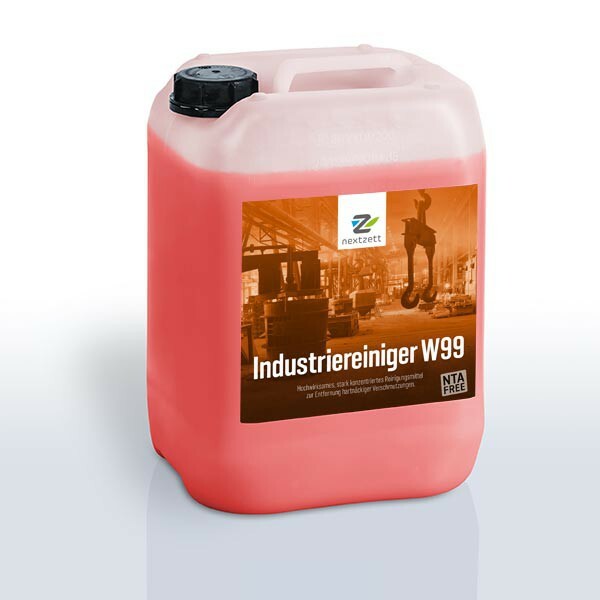 nextzett Industrial Cleaner W99 is an extremely fruitful, overbased special concentrate based non-ionic surfactants, which reliably animal and vegetable fats, protein, aged wax and Harzverkrustungen and charred residue and micro dust removed. The surfactants used in the formulation are in accordance with EU detergent regulation 648 / 2004 Annex III completely biodegradable. commercial vehicle washes and for manual application in manual spraying equipment.